These are a gorgeous, not-too-sweet cookie. 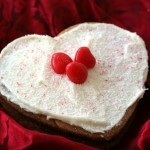 Sparkly with sanding sugar, subtly hot with candy hearts, sweet with vanilla icing. They are like that perfect kiss. In a bowl with your fingers, whirl or rub flour and butter until mixture forms pea-sized lumps. Add cream and stir with a fork until dough holds together. Pat dough into a ball, then divide in half. Flatten each portion into a 5-inch-wide disk. Wrap airtight and freeze until firm, about 15 minutes. Sprinkle work surface with 6 tablespoons confectioner’s sugar. Dust rolling pin with 2 tablespoons sugar. Roll dough on sugar, one disk at a time, to 1/8 inch thick, turning over frequently and dusting with more sugar if needed to prevent it sticking. 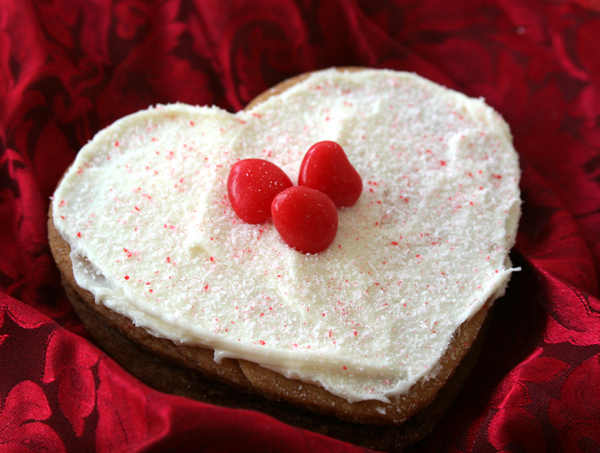 Cut out cookies with a 4-inch heart cutter. Gather excess dough into a ball, re-roll (adding sugar when/if necessary) and cut out remaining cookies. Place cookies ½ inch apart on buttered and floured or parchment-lined 12- by 15-inch baking trays. Refrigerate for about 20 minutes prior to baking. Bake cookies in a 315 F oven until golden, about 15 – 20 minutes, switching trays halfway through baking. Allow cookies to cool slightly on trays and then transfer to racks to cool completely. Meanwhile, make filling: in a bowl with an electric mixer on medium speed, beat butter with powdered sugar and vanilla. Stir in enough milk to make mixture smooth and thick enough to spread. Spread one side of half the cookies with vanilla buttercream filling. Top with remaining cookies. Make topping: Combine icing sugar, butter, cinnamon sugar, vanilla and milk, beating until creamy. Thin with a few more drops of milk (if necessary) to reach spreading consistency. sanding sugars and candy hearts or sweet-heart candies. Cinnamon. Vanilla. Combine them with the sweetness and smooth texture of icing, between two deliciously crunchy cookies. One bite and I guarantee you’ll be wanting more.